The frost flowers are frozen in place at Clay and Limestone this week. With temperatures only reaching about 35F you can find them in the shadier parts of the garden all day long. Pure white, ribbons of ice that have formed on cold nights. Hard to believe that a flower can produce such ice sculptures over and over again. Several readers have expressed interest in Frost Flowers after a recent post. Sue, from A Corner Garden, thought I might be teasing that such a flower can exist. But exist they do! Those of you with long memories will recognize some of this post~It's a post from last year that I've reworked with new information and photos. I hope you come to love this native as I have. Verbesina virginica (White Crownbeard) is a stately queen among the rough and tumble flowering natives in my garden. An easy to grow plant that can be found in woodland margins, openings in woodlands, flood plains, thickets, roadsides, stream banks, pastures; damp soils. Beloved of bees and visited by many butterflies, verbesina is rarely munched on by deer or rabbits. I've come to love this plant since I first saw it growing in the wayback backyard~behind the Garden Of Benign Neglect; a tall plant that I decided to watch for a season to see what it could be~ This tall asteraceae family member (can reach 6 or more feet) is a plant that most of us wouldn't give a second look~At least not until it bloomed along with other Autumn beauties. Imagine a beautiful late fall day; it's warm and the sun is shining. The verbisina's roots draw water up into the stem and late that night when the temperatures drop well below freezing, the stems freeze, split open, emitting plant juices, which immediately freeze into ribbons of ice that curl around the stem and the base of the plant! Everyday there is something of the marvelous to behold. Now aren't you glad we didn't mow this plant down after one look at those flowers! The stems are winged so look for this characteristic when id-ing them in the wild. Frost flowers will continue to form as long as the temperatures are cold and the plant juices are flowing. White Crownbeard/Verbesina/Frostweed has been selected for monitoring by Monarch Watch because it's an important nectar plant for monarch butterflies. PS If you don't like the white it does come in yellow! Hey .. I believed you with the "frost flowers' .. since I am Canadian I have seen some weird and wonderful miracles in my own garden .. so the potential for that to happen in other gardens not matter the zone is THERE! In the Great White North ! Lovely and such a wonder! Thanks for sharing! Have you seen if there are seeds to collect or did I miss that part? I know it's ice but it makes me want to touch it because it looks so soft. Hi Gail - thanks for the extra info. I have looked here in the Uk and although the RHS list a couple of nurseries for this plant they dont appear to stock them anymore. If the plant does produce seed next year and you can send me some (if US rules allow) it would be wonderful. I've never seen this phenomenon. I agree: it's worth growing plants that can dance with the weather in this way. Just fascinating and surreal. What's the science behind it, I wonder? Gail, I'm so glad you re-posted some of the information from last year. Although I remember that first post, I'd forgotten how frostweed created these magical blooms. Nature is simply amazing! Everything is a miracle to me. These frost flowers are a miracle. I will have to seek out some of these and plant them where I can watch this miracle happen. Very nice shots, I am headed out in single digit wind chills in hopes of seeing one.I am in iowa and never have seen them perhaps they are covered with snow whenthey form. Our ground is clear until the weekend. Very cool. Winged stems you say? I will have to be more observant. I do love the photos of the 'blooms', very cool. Very cool! I have never seen one but will have to make sure I grow those plants in the future. I don't grow either the live or frozen flower, but I will try for both now! Sweet! They are fascinating and I've enjoyed learning about them! Thanks! I simply cannot get enough of these frost flowers. I have never seen or heard of them until this past week. I am so in awe of the natural world. Thank you so much for introducing this natural wonder to those of us who are new to them. This is just fantastic, Gail! We don't have this plant here so I've never been introduced to its beauty in all seasons til reading your blog. I have to settle for frostflowers of the actual, frosty kind. I love those plants as well as their frost flowers! I looked it up, since I hadn't heard of them that I remember. They are native to Kansas, which is south of Nebraska, and Iowa, which is to the east. I'll have to see if I can find some to grow here. 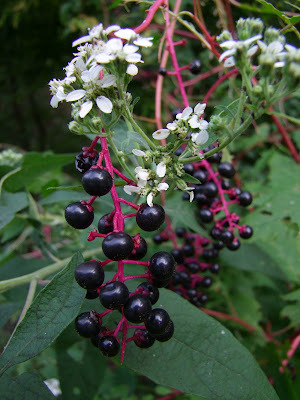 I do have some pokeweed growing at my garden across the street. This is so cool! I really wish I had a good spot to grow these! I've never seen such a thing! How very, very cool is that! They are truly wondrous Gail. I think I need them in my garden ~ if they like cool temperatures I could have them almost all winter!! I'll have to do a hunt for some seeds. Hope you're doing well? Hugs. Gail, These are so beautiful and I had no idea of how they formed! What a wonderful gift to the late fall garden. I love your name for them too. Lovely!! These are new to me. I thought it was fake at first! Splendid photos! 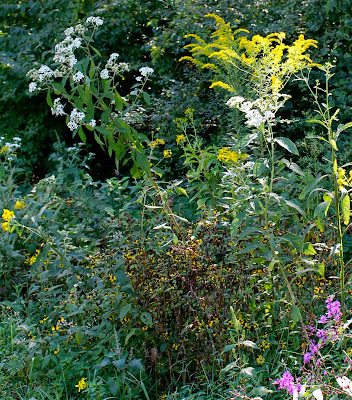 We ran across 'ice flowers' of goldenrod in the forest years ago (without a camera, alas). Those frost flowers are lovely. Some of them look like white ribbon candy. That's funny that Sue thought the flowers were a joke at first! I can see that, but now I have to try to get this plant in my garden. Need to check to see if Prairie Moon carries seeds. The frost flowers are such an interesting and beautiful phenomenon. I'm mourning the loss of all of the beautiful wildflowers you have pictured here, along with the Goldenrod and Ironweed. Our property backs up to the TVA land that runs through southern Davidson county and I've always considered that strip of land as my own personal garden of benign neglect. Last week, in the name of homeland security my garden was mowed to the ground. Losing this beauty does not make me more secure. My bunny friends will probably move along with the owl, hawks and other critters that make up this delightful circle of life. The other day I walked to the back of our property and was shocked and delighted to see frost at the base of the chopped off Frostflowers. I hope the TVA doesn't notice because there's just no telling what additional measures they'll take to protect me from all those terrorists hiding out in the stubble. These are quite amazing Gail - and something I have not come across - if you send seed to Patient Gardener I will have to ask her to grow some for me - although I am not sure if they would like it here, we may be too wet and not quite cold enough! Every year I look forward to seeing your frost flowers, and maybe some day I'll grow them myself! That is so amazing and beautiful! Nature is fascinating!